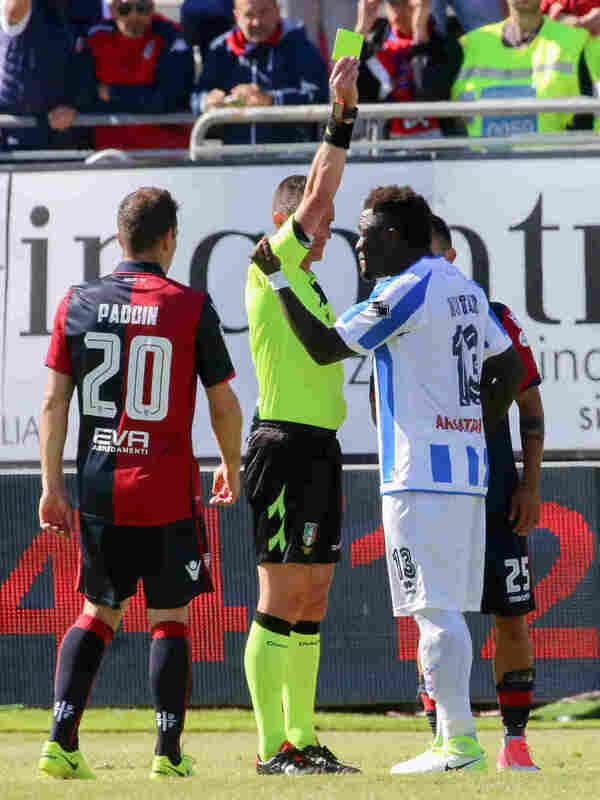 Ghanaian Soccer Player In Italy Protests Racial Taunts — And The Ref Penalizes Him : Goats and Soda Midfielder Sulley Muntari is from Ghana. When spectators hurled racial epithets at a match in Italy, he complained to the referee. The ref gave him a yellow card. 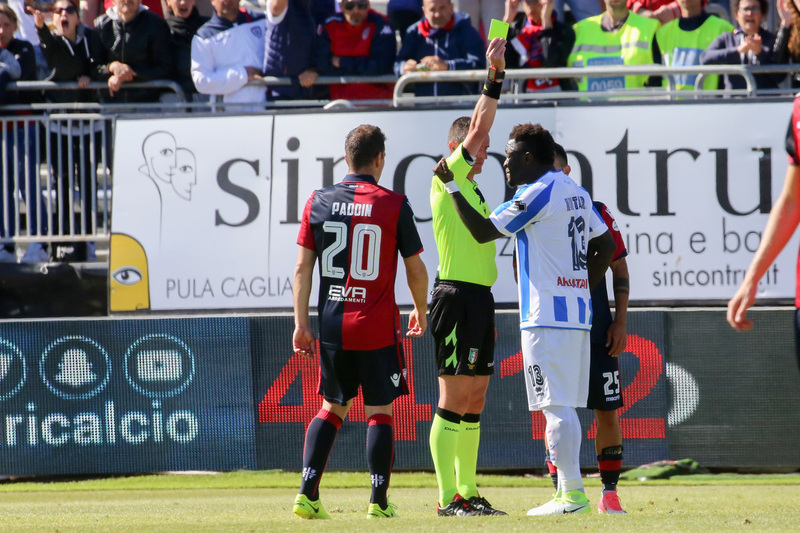 After Sulley Muntari (right) heard racial slurs from fans during a match in Sardinia, Italy, on April 30, he protested — and got a yellow card from the referee. A supporter holds the card aloft. Soccer star Sulley Muntari finally got fed up. He's a midfielder from Ghana who plays for the Italian team Pescara. Last Sunday in a match against Cagliari in Sardinia, a bunch of spectators taunted him with racist chants. He reportedly shouted, "This is my color" and went to the referee to ask that the game be halted. Instead, he got a yellow card. The card means he was booked for dissent, a punishment doled out to players who touch or verbally abuse officials. Muntari then walked off the field to protest, earning him a one-match suspension, which was just overturned Friday night. The Italian incident has provoked an international outcry. The United Nations High Commissioner for Human Rights called Muntari "an inspiration." And everybody's talking about the incident in Ghana, where the 32-year-old Muntari was born and launched his soccer career, says sports radio host Daniel Kwaku Yeboah, who's also managing editor of Ghana Sports Online. Many people in Ghana think the referee was out of line in punishing Muntari, but others think, "there's no use" in hoping for change, says Yeboah, who can recite a long list of African soccer players who have been subjected to racist slurs in Italy and elsewhere in Europe. Most of the time, this racism doesn't make headlines. Yeboah says Ghanaian player Augustine Ahinful told him about hearing racially charged chants during an Italian match. When Ahinful asked a referee to address the chants, the referee just insulted him in Italian. Ahinful knew exactly what had been said — and realized that the referee probably assumed he didn't understand Italian. So Ahinful just concentrated on playing, Yeboah says. Other players have told Yeboah they've been taunted by their own teammates. What makes Muntari special is that his case is getting attention, Yeboah says. But he doubts it will last long. "Normally we don't talk about [racism] until something crops up. Then it goes to sleep," he says. Established stars get used to it, Yeboah says, "but for up and coming ones, it's difficult to handle." Many young players are reluctant to play abroad, he says, but go anyway for economic reasons. "Most Italians will tell you it's not real racism, they're just supporting their team," says Francesco Ricatti, a senior lecturer at the University of the Sunshine Coast who studies football, migration and politics. Meanwhile, Muntari came up with a way to reach out to his taunters. During that game in Sardinia, he gave his shirt to a kid he saw participating in the racist chanting. "I needed to set an example so he grows up to be nice," Muntari told reporters.